I think my first post of 2016 was about meeting in Gifu with a builder of these: cormorant fishing boats. 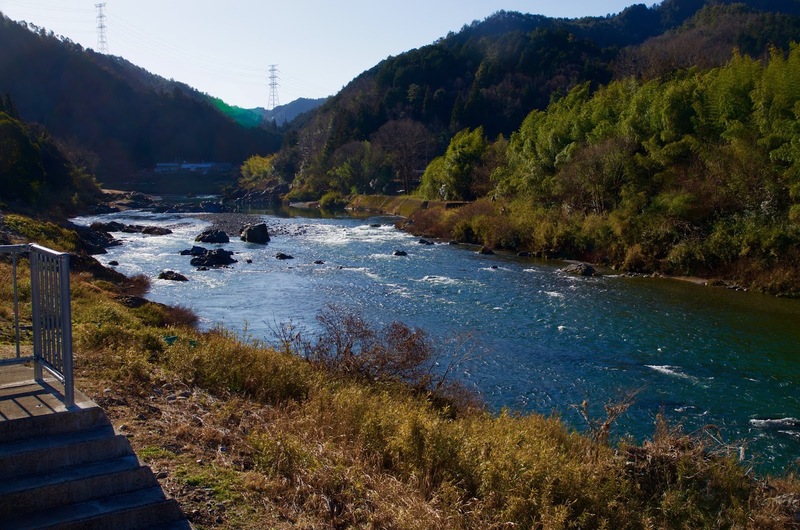 Gifu is the most famous place in Japan for this kind of fishing, which is done at night and now is a tourist attraction, with over 300,000 people a year riding observation boats watching six fishermen on the Nagara River. Forty-two feet long and a little over three feet wide. The plan is for me to come back mid-May to start this project. 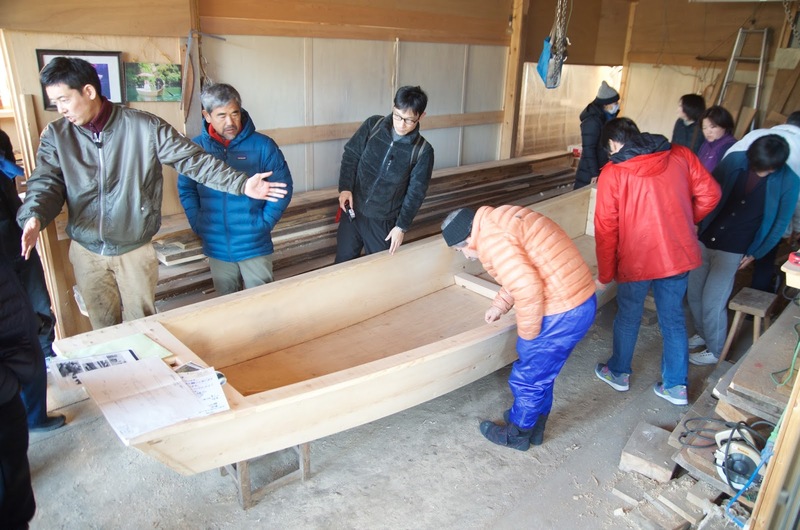 My friend Masashi Kutsuwa (right) a furniture instructor at the Gifu Academy of Forestry, has been an invaluable partner in this project. 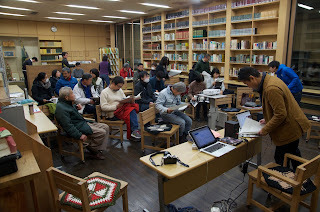 He organized a meeting of people interested in the research and we gathered last Monday evening at the school. 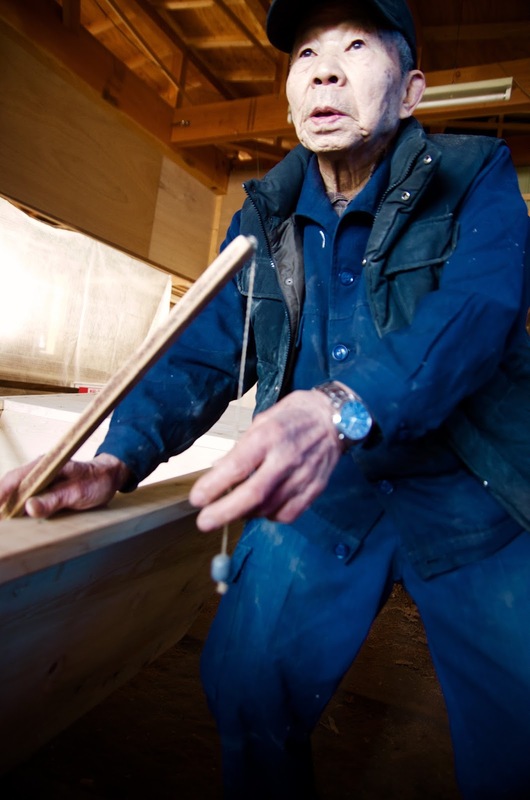 Mr. Seichi Nasu, 85, is perhaps the last builder of these boats. 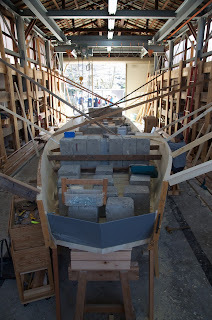 His sole apprentice was the original boatbuilder I was going to work with, but he seems to have stopped working. 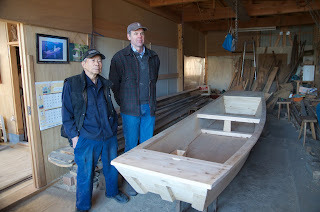 So our project had to pivot and Nasu san agreed to direct me building a cormorant boat. 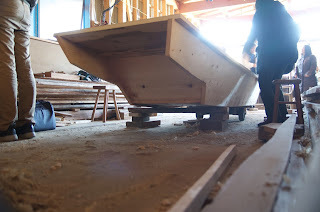 He still builds smaller boats from time to time but in this project I will do all the physical labor while Nasu supervises. 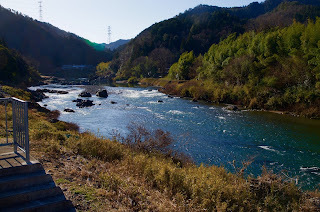 A branch of the Nagara River and the view from Nasu san's shop. 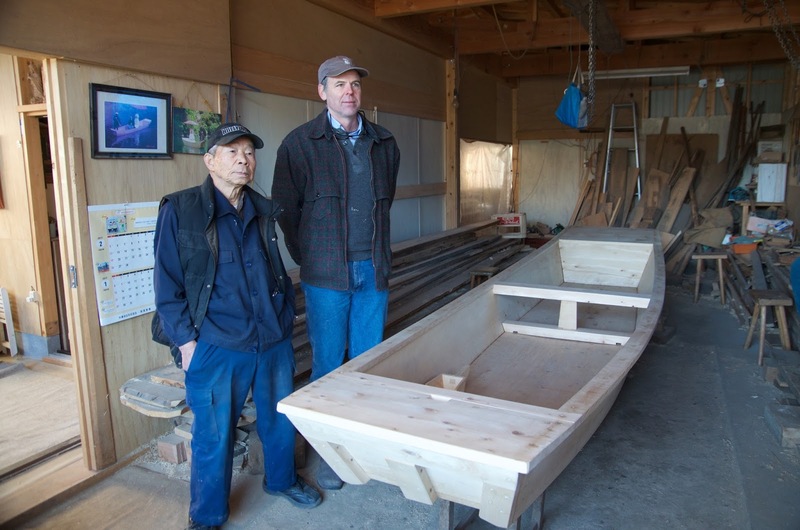 He's just completed building three of these rice field boats for a park. At the meeting Nasu san told the audience he has built over seven hundred boats in his seventy-year career. If so he's the most prolific boatbuilder I've ever met in Japan. 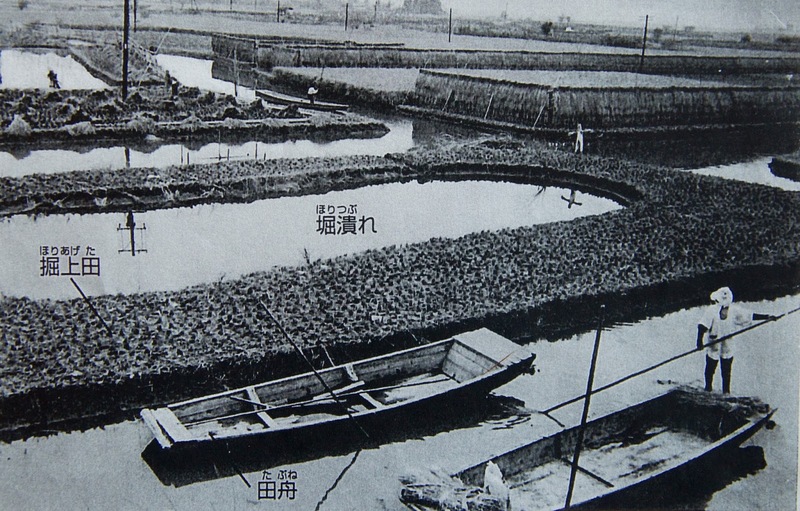 A historic image showing how the boats were once used. 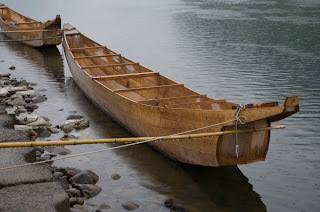 I built a similar type of boat exactly a year ago in Himi, Toyama. Interesting long overhang to the stern of the rice field boats. The operator stands on the stern deck. A wonderful home-made ink line. He uses red ink for some reason. I've only ever seen black used. 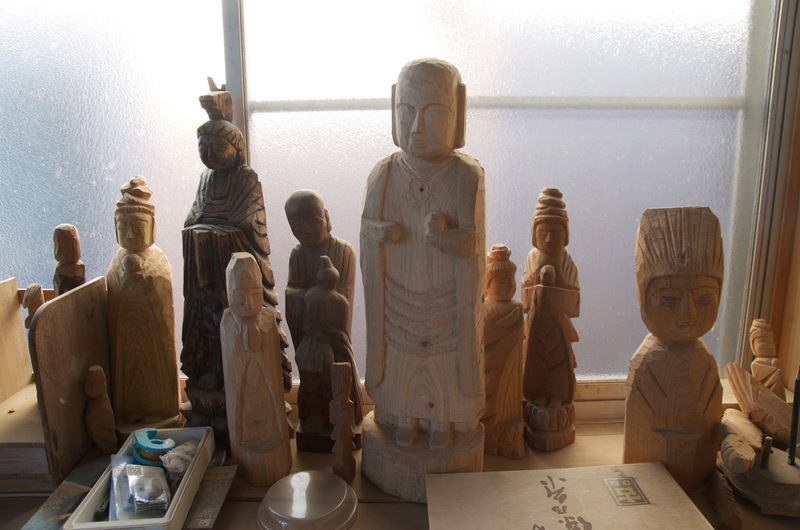 In retirement Nasu san likes to do these carvings of Buddhist figures. The day after our meeting we organized a tour of Nasu san's shop, and saw his rice-field boat. 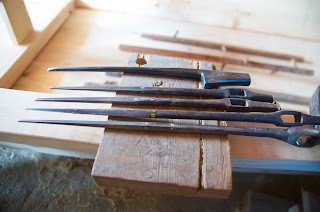 So in the Gifu region boatbuilders use a square-shanked nail. I've never seen this anywhere else, though temple carpenters use a similar type of nail in roof framing. Otherwise boatbuilders' nails are forged from flat steel. 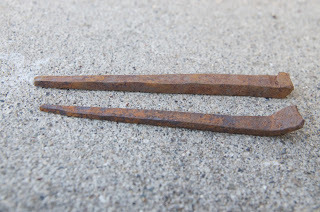 The other unique nail is the kasakugi, or umbrella nail. 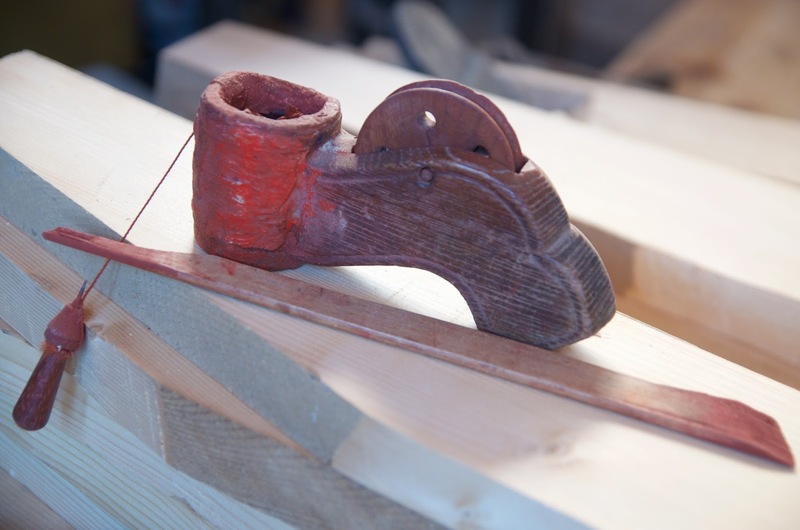 It has an angled head and is used to connect the garboard plank to the bottom. 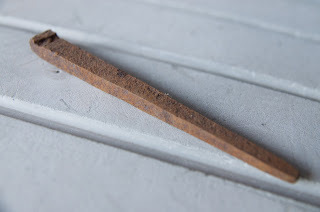 Nasu san made a point of saying he likes to soak his nails in brine to get some rust on them. 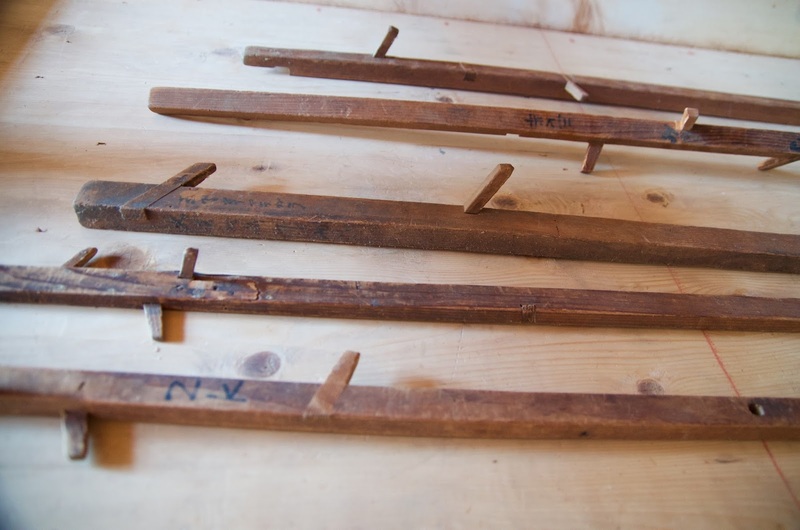 He says it gives them a grip in the wood and they hold better. I've heard this technique from one other boatbuilder here. 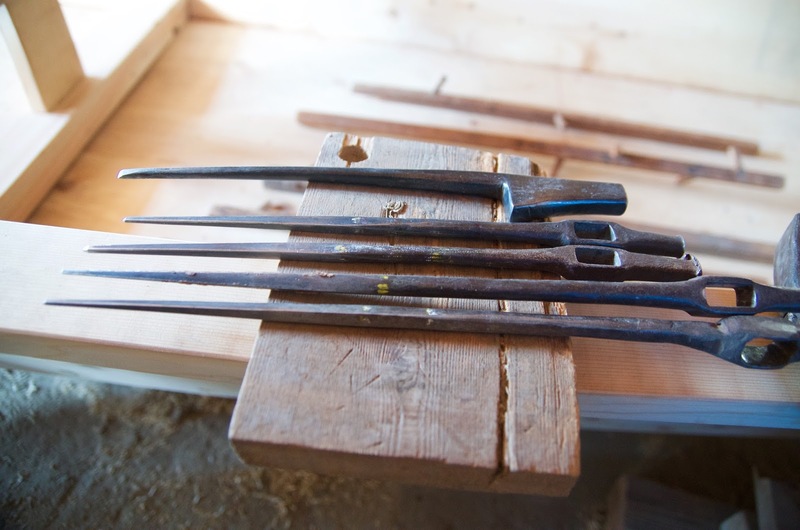 The heart of the beast: these sticks are Nasu san's patterns for building the cormorant boats. 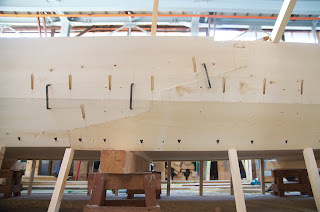 They are plank angles for each plank at various spots along the hull. 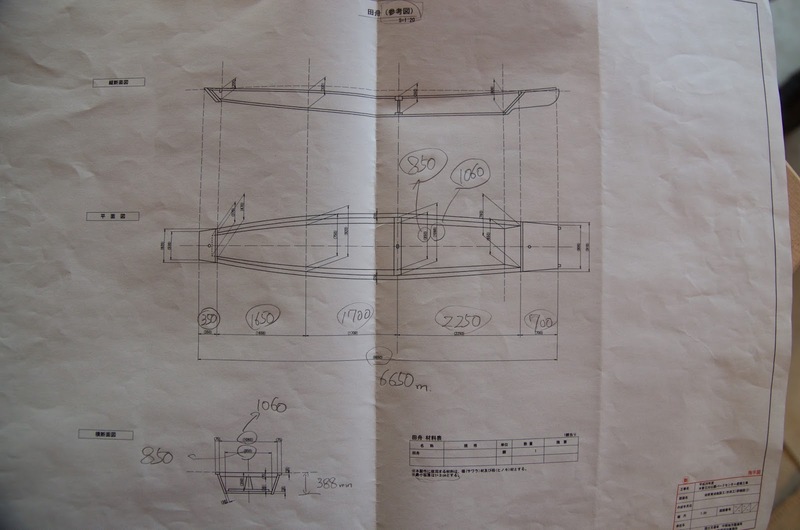 He uses no drawings whatsoever and relies upon memorized dimensions for everything else he needs to layout the boat. The central point of my research will be recording all of this and document the techniques, getting it down on paper, photographs, and drawings for preservation. 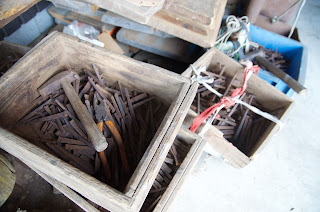 This tool is called the momojiri, and is an ancient type of drill from China. 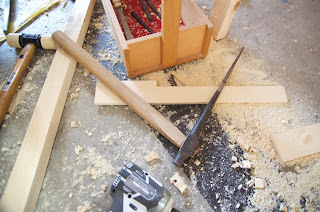 You insert a handle in the hole then pound the chisel and pivot it. 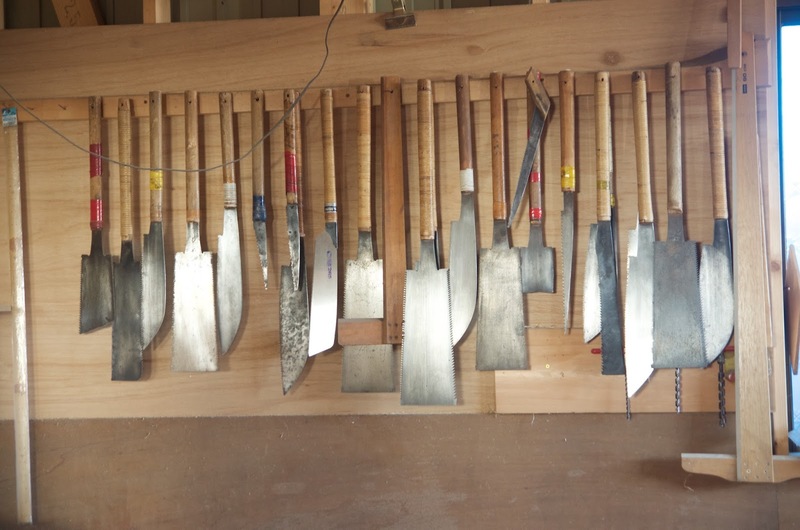 Nash san is the only boatbuilder I know in Japan using these, which he calls "momiji." Nasu san uses this plumb bob and stick to set plank angles. He measures the horizontal distance between the string and a mark on the stick. 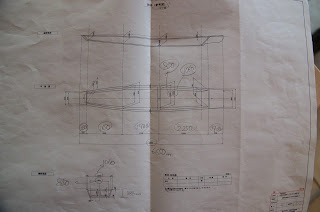 This dimension is called hiraki and he remembers all of his angles as the horizontal measurement. 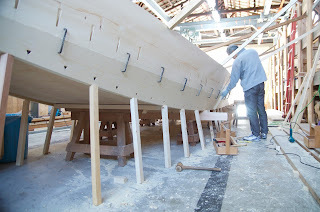 This is pretty standard among boatbuilders throughout Japan. Interestingly most builders call this tool the sagefuri, but while my Tokyo teacher used one he told me it had no name. Everyone wanted a portrait of Nasu san and me with his latest boat. 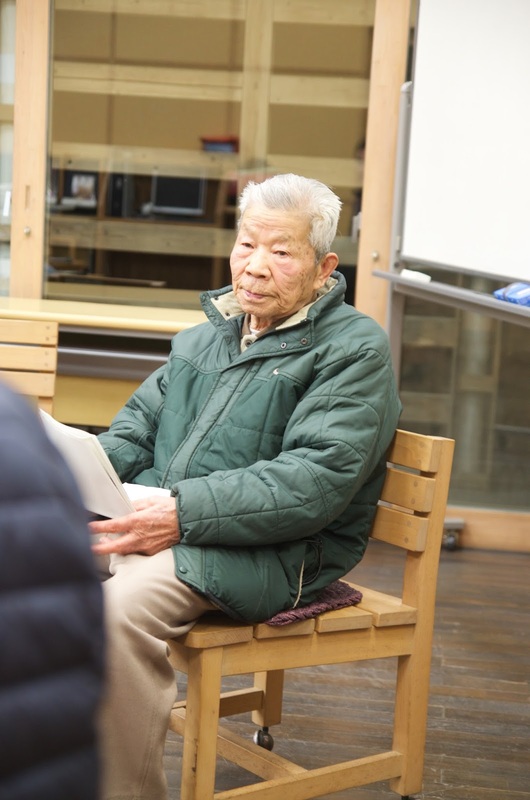 I've been visiting Nasu san for almost twenty years, and while he was friendly (he gave my wife a bailer when she admired it) I could never get him to agree to teach me. As he got older it became untenable because he could only work a few days a week on a large boat. So last year we decided I would work with his apprentice and then that fell through. I am obviously grateful Nasu san has agreed to do this, mostly because he truly is a master of these boats, and he's also a wonderful man. We'll be living in Nasu san's town of Mino, which is famous for the preserved architecture of its old town. Those second floor wall extensions were to stop fires from spreading. 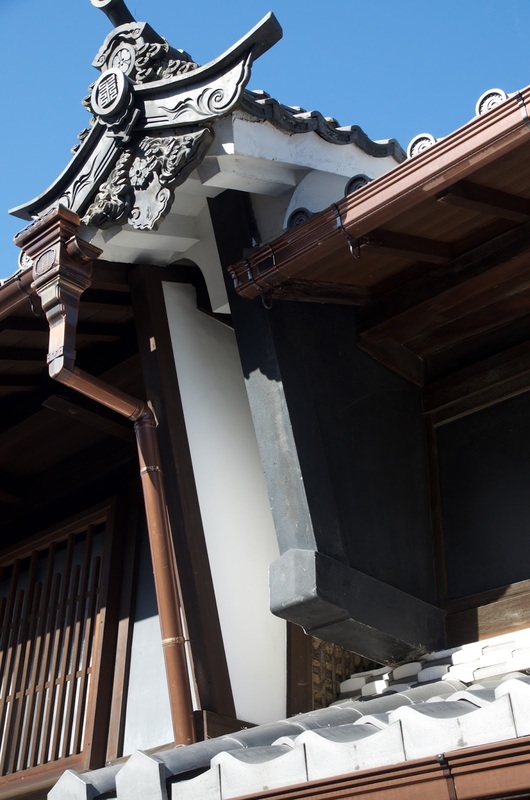 As Mino became wealthier, it became fashionable to show off one's wealth by embellishing them. 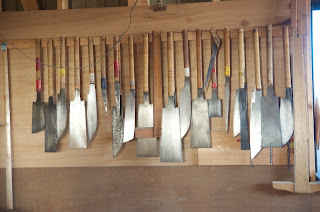 We also toured the Gifu City boatshop. 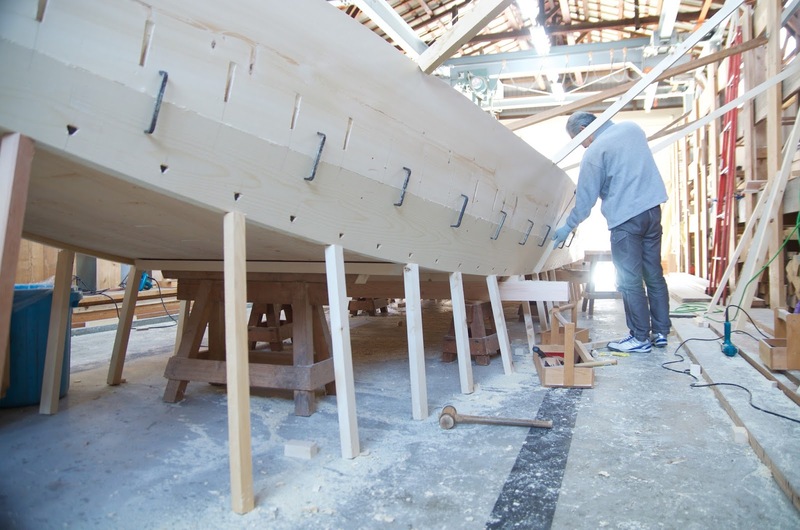 They build all the tourist viewing boats while Nasu san has built the actual fishing boats. Note the modern take on the sagefuri, which I think the shipyard boatbuilders made and is not commercially available. 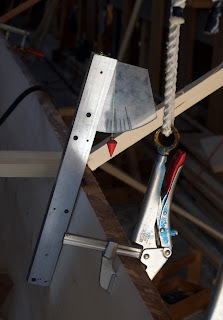 I also love that vise grip clamp. 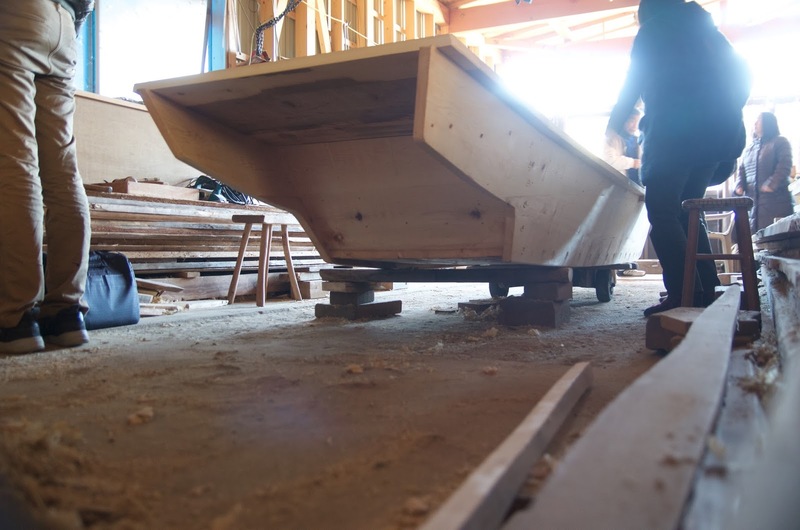 River boat builders tend not to brace their boats overhead for some reason, instead relying on heavy weights place inside to fix the hull while planking. Nasu san uses a pair of small boulders. One of the shipwrights drilling and setting nails in the planking. 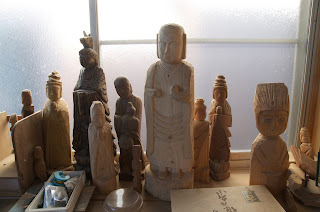 He had a great tapered twist drill but he finished every hole with the traditional momjiri. Typical style of scarfing planks in Japan. Note how close the two scarfs are to each other, something we are taught is bad in western boatbuilding. I'll need to quiz Nasu san on whether there are any rules about spacing or overlapping scarfs. The six active cormorant fishing boats taped for the winter. 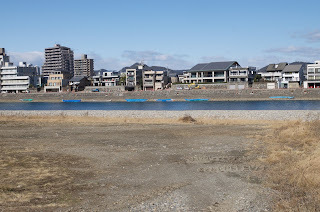 There are six usho, or fishermen in Gifu. The senior fisherman is the 17th generation of his family to do this work, which runs from March to September, I think. 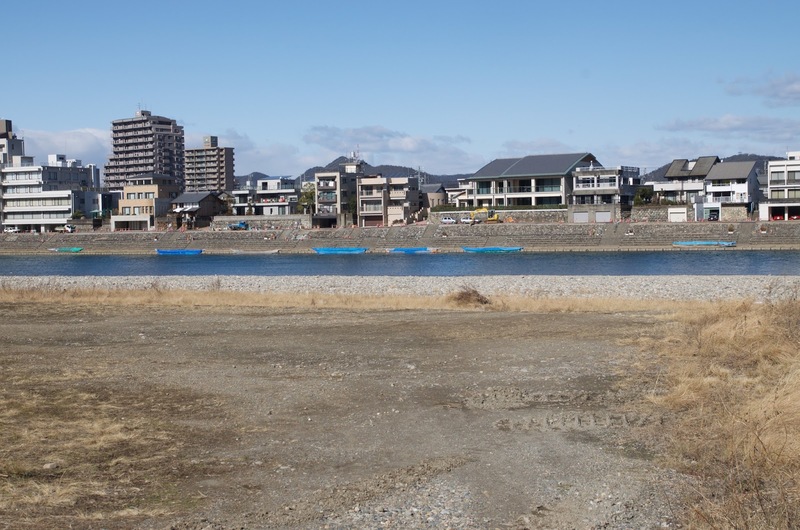 There are about five other places in Japan where they do this, but with 2-3 fishermen only (and one woman usho in Uji City near Kyoto). 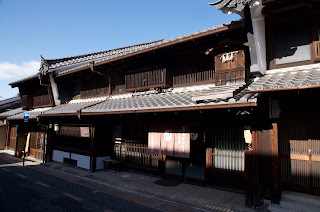 Gifu by far is the most famous place for this.